Josh Hanagarne couldn't be invisible if he tried. Although he wouldn't officially be diagnosed with Tourette Syndrome until his freshman year of high school, Josh was six years old and onstage in a school Thanksgiving play when he first began exhibiting symptoms. By the time he was twenty, the young Mormon had reached his towering adult height of 6'7" when — while serving on a mission for the Church of Latter Day Saints — his Tourette's tics escalated to nightmarish levels. Determined to conquer his affliction, Josh underwent everything from quack remedies to lethargy-inducing drug regimes to Botox injections that paralyzed his vocal cords and left him voiceless for three years. Undeterred, Josh persevered to marry and earn a degree in Library Science. At last, an eccentric, autistic strongman — and former Air Force Tech Sergeant and guard at an Iraqi prison — taught Josh how to "throttle" his tics into submission through strength-training. Today, Josh is a librarian in the main branch of Salt Lake City's public library and founder of a popular blog about books and weight lifting—and the proud father of four-year-old Max, who has already started to show his own symptoms of Tourette's. 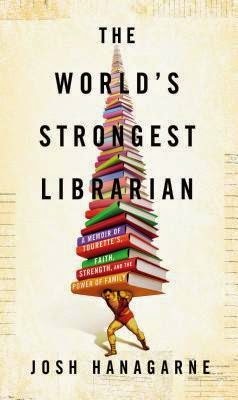 The World's Strongest Librarian illuminates the mysteries of this little-understood disorder, as well as the very different worlds of strongman training and modern libraries. With humor and candor, this unlikely hero traces his journey to overcome his disability — and navigate his wavering Mormon faith — to find love and create a life worth living. This was one of those book that I've been meaning to read for over a year. People have raved about it and recommended it. I've had it out of the library at least 3 times, every time it returned unread due to my "reading load." And then, finally, it ended up on the 2015 schedule for my book club! Now, I had to read it! And, boy, was the wait worth it. I worried a bit about it not living up to the hype, but this book fared that storm admirably. I am chalking that up to the fact that this is, at its core, a humble and personal story from someone who strives only to live his best life. There is a lot in here. I'll admit that I know very little about Tourette's and I know enough about strength training to know that it is not my favorite form of exercise. I do, however, know quite a bit about libraries--of all the jobs I've held in my life, my favorite is that first one right out of college--at the public library! Hanagarne is an incredibly likable guy--I sincerely want to be this guy's friend. And get access to his reading list (beyond Stephen King). I related to his childhood in that I was also that kid who never quite fit in and had to find my own world (mine through writing and his through reading). He was a normal teenage guy with normal teenage guy feelings who just happened to have a syndrome that makes life much more of a challenge. I appreciated that Hanagarne was honest--with and about himself. Something that I find common, and annoying, in memoirs is that people tend to hold themselves in a better light than they should. When I find a writer who does not do this, I want to shout, "Look! THIS is how to write a memoir!" I don't want to read about perfect beings, I want to read about real people and Hanagarne is one of those people. This book is very readable--each chapter begins with a scene from the library and then goes back into an episode in his life. I found this structure very unifying for the book--it tied Hanagarne's current place in life to where he was, which I think is important in a memoir. I will admit that there were sections--okay, they dealt with the nuts and bolts of his strength training--where things got a little slow for me. However, I think this is a preference issue more than any defect of the book. I'm sure that there are readers who found the library sections tedious, but I loved them. This is one of those books that has something for everyone and it is one that I feel that I could recommend to anyone--however, I feel it is an especially good book to recommend to those who do not normally read memoirs, as I feel that this is a good "gateway" book to the genre. But, even if memoirs are your genre of choice, this should be a fulfilling read for you.